Sean Isaac pursues the adventure and exploration aspect of climbing with a passion for new routes and travelling the world. He has completed 14 major mountain expeditions forging new routes up remote and obscure alpine peaks in all corners of the globe, including Patagonia, Kyrgyzstan, Alaska, Northwest Territories, Peru and Pakistan. In Patagonia, he has four summits to his credit including a winter ascent of Guillaumet in the Fitz Roy region of Argentina with Will Mayo and the first ascent of the often tried, 800-metre east pillar of Cerro Mascara in Torres del Paine of Chile with Conny Amelunxen. The later required 19 days of climbing with 14 of these days spent living on the wall enduring constant storms. He has been on three expeditions in the ex-Soviet republic of Kyrgyzstan resulting in nine alpine ascents; seven of which were new routes, five of which topped out on unclimbed peaks. In the world-famous Bugaboo range of British Columbia, Sean has established six new routes, including the hard mixed line of Spinstone Gully (TD+ M7 R) with Scott Semple, which was runner-up in Climbing magazine's "Golden Piton Award". In addition, he and Marc Piche made the first winter ascent of Pigeon Spire by climbing a mixed gully on the north face. On his first trip to Alaska in 2004, he managed two first ascents with Shawn Huisman: Canadian Bacon (ED- M5 WI4) on the east face of Royal Tower and Maxim (ED- M4 WI5) on the south face of Thunder Mountain. 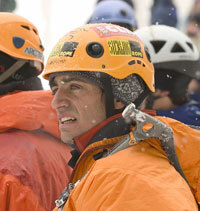 Returning in 2005, he opened a new route on the northwest face of Kichatna Spire with Roger Strong and Rob Owens. Even though their Voice of Unreason (ED M7 A1 WI5) did not go to the summit, it required difficult ice and mixed climbing completed in a 25-hour push. Closer to home, Sean has helped to push mixed standards in the Canadian Rockies. He has established over 70 new mixed routes ranging from desperate single-pitch drytool roofs like Phyllis Diller (M11) to multi-pitch monstrosities like Cryophobia (V M8+ WI5+, 240m) with Shawn Huisman. He has also made quick repeats of testpieces like Musashi (M12) and Rocky Mountain Horror Show (M12) at the Cinpelex cave. Sean is equally adept in competition having earned 4th place in Festiglace du Quebec, 3rd place in mixed climbing in the Ouray Ice Craft Invitational and 1st place in the Canmore Speed Competition. In addition to hard mixed climbing, he has climbed 5.13 sport, 5.12 trad, and WI6 ice. Articles and photos of his expeditions and local climbs have been published in numerous international periodicals including Climbing, Rock and Ice, Alpinist, Men's Journal, Outside, Gripped, Explore, High, Climber, Desnivel, Klettern, Su Alto, Canadian Alpine Journal and American Alpine Journal. In addition, Sean is the author of "Mixed Climbs in the Canadian Rockies" published by Rocky Mountain Books and "How to Climb: Mixed Climbing" published by Falcon Books. Sean is the featured mixed climber in "Beyond Gravity", "Unleashed" and "Higher Ground". All of these films have been screened at various international mountain film festivals and on television. In addition to working as a fully certified ACMG Alpine Guide, Sean sponsored by Arc'teryx, Black Diamond Equipment, Sterling Rope and Clif Bar. He lives in Canmore, Alberta in the Canadian Rockies.